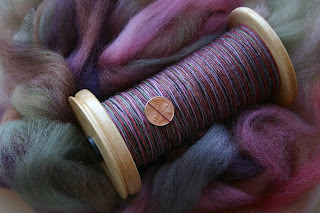 Finished spinning, plying and skeining (using a niddy-noddy; a first for me!) the BeeMiceElf Falkland during today's Tour. 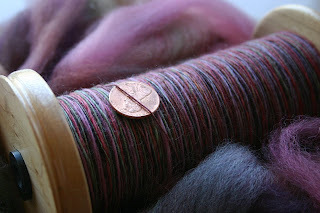 I'm really pleased with how the yarn turned out, all 248 yards of it. It was too dark by the time I was done to get photos of the finished yarn - this is the pre-plyed singles - so I'll post those tomorrow. Hmmmmm, what to spin next . . . .
Wanna vote? My Day 8 pictures are here; I don't think Ginny has one posted today. Just click the 'love' button to vote for your favs (as many as you want).